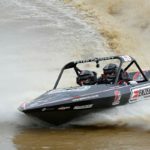 Canterbury racer Peter Caughey has extended his lead at the midpoint of the MouthFresh SuperBoat championships, with a commanding win at Waitara on Saturday – despite getting airborne at 120km/h. Rob Coley in the Nissan twin-turbo Sprintec threw down the gauntlet with a 40.8-second time early in the day at only the second event he’s raced in his new craft. Nick Berryman had been consistently quick, but had a navigation issue in the final. Rob Coley’s moment at the hairpin meant he hit a 42.57, and Caughey crossed the line in a blinding 40.3 seconds. Caughey said all the crews faced very changeable air conditions as temperatures rose and dropped. Caughey and his crew now head back to their Canterbury workshop to check the boat over, before making the long drive to Hastings for the fourth round of the series.